I'm Seeing Green: Killer Plastic in Water Bottles? Killer Plastic in Water Bottles? Just when you had given up your plastic bottles for a permanent solution, and decided to buy a polycarbonate Nalgene bottle, news about bishpenol A, "an endocrine disruptor, [of which there] is growing concern that long term low dose exposure may induce chronic toxicity in humans [wiki]." Health Minister Tony Clement will make the announcement in Ottawa alongside Environment Minister John Baird and Christian Paradis, Secretary of State for Agriculture. The official declaration of the synthetic chemical compound as a toxic substance under the Canadian Environmental Protection Act will kick-start a risk assessment process that could lead to a ban in baby products, water bottles and food containers. Retailers have already begun to pull plastic products containing bisphenol A in anticipation of the announcement. 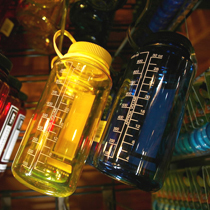 Nalgene, the brand that popularized water bottles made from hard, clear and nearly unbreakable polycarbonate, will stop using the plastic because of growing concern over one of its ingredients.The decision by Nalgene Outdoor Products, a unit of Thermo Fisher Scientific, based in Rochester, came after reports that the Canadian government would declare the chemical bisphenol-a, or BPA, toxic. Some animal studies have linked the chemical to changes in the hormonal system. Those reports also prompted many of Canada’s largest retailers, including Wal-Mart Canada, to remove food-related products made with plastics containing the compound chemical, like baby bottles, toddler sipping cups and food containers, from their stores this week. Begs the question as to why the chemical is even needed as a liner in cans, which did not have anything foreign for decades and served quite adequately as containers. Other exposures result from BPA's use in "films, sheets, and laminations; reinforced pipes; floorings; watermain filters; enamels and vanishes; adhesives; artificial teeth; nail polish; compact discs; electric insulators; and as parts of automobiles, certain machines, tools, electrical appliances, and office automation instruments" (Takahashi and Oishi 2000). The reaction of the sun rays with the plastic bottle produces harmful effects. "Water" has also called as "Life" and It's a very true about all the living beings in the world. So that to live healthy and Fit everyone wants to a clean water. It's very interesting post here. Thanks for sharing it. This is very interesting information found about "Plastic in Water Bottles". Really It would found very helpful. Thanks for sharing it. It's true that plastic bottle produces harmful effects on human body. Keep posting. I'm looking for some more informative articles from you. You did really a great job. I found your blog very interesting and very informative. I think your blog is great informaiton source & I like your way of writing and explaining the topics. Keep it up. I'm going to follow your blog. Hello thanks for your submit , I like your blog and i will certainly come back to examine extra about this subject! Again thank you and I ve just bookmarked you , sorry for my english ! We must get rid of plastic usage, let be natural as much as we can. By using plastics, we are indeed killing ourselves slowly but surely. I am glad that there are countries already that take action on the on going problem of the world. Im glad ive seen this site. I used to use plastic as water container... thanks a lot for this info really helpful. Thanks for warning. There are really some container that is not safe.